Stair construction is always a complicated business, but when it comes to building curved stairs and building beautiful curved stairs we reach the summits of art and technique. 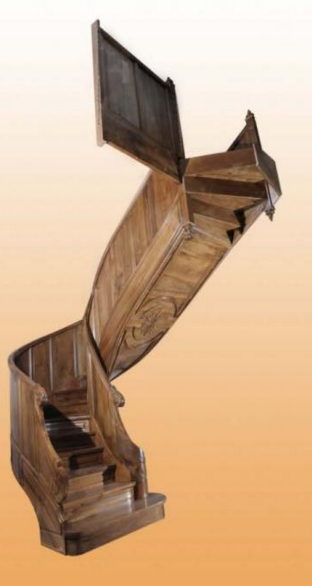 It’s not by chance that the curved stair is considered one of the summits of the art of wood. This particular craft has always been considered the pinnacle of achievement for the master carpenter, requiring the marriage of the brain of a mathematician and the eye of an artiste, 2 qualities that are rare to find in the best of men. We would like to introduce Alain Marin, who operates with his team an award winning stair company in France. Alain has spent the last 30 years building exceptional and prestigious stairs across France and Europe, he has kindly written about his experiences and shares in particular how he recently used our horizontal laminate stair construction method on one of his projects. We’ve also created a video from his photographs to show you the process. Hello, my name is Alain Marin, I run a small wood working company that has existed since 1980. Situated in Tholonet near Aix en Provence in the south of France, specialising in stair building for many years, we are today mainly involved in highly specialised projects like curved and wreathed stairs and handrails. Today we work across all of France and have participated in some important jobs like the private stair of the ‘Principauté de Monaco’ that was inspired by a 17th Century church alter stair. This stair won us the 2009 ‘Artisan d’Art’ prize. Don’t hesitate to contact us if you would like to us to help with your stair projects. Passionate about wood working and especially stair building, I’m always looking for ways to work better and more intelligently. When I fell on Ness’s site, I immediately felt that we shared the same passion of work well done while continually searching for new and creative ways to improve the way we work. It’s now several years that I’ve known Ness and I’ve been following closely his websites and the presentation of his innovative techniques for building curved stairs and handrails. A few months ago, I had an order for a stair with a central cut string. Usually I would build this type of stair using traditional laminated techniques. This is a long and tedious job, especially the cutting of the step supports that have to be cut precisely into the thick curved laminated beam. Looking at Ness’s horizontal laminate technique that he presented on his website, I asked Ness for more information on how to apply his technique. Speaking to Ness, I realised that the technique would be well adapted to building the string for our project. A few weeks later with a few guidelines from Ness we started building the stair using horizontal laminates. I really can say that I’ve been very happy with my decision and the way this project has worked out. So a big thanks to Ness and the team at Wood Designer for sharing their know-how so generously. Here’s short video that shows the different stages of our construction process. Thanks to Wood Designer for setting up the video. Please note, on the right side of the video tool bar is a button to view the video full screen. If you’d like to find out more about horizontal laminates and other stair construction techniques, please click here to sign up for Wood Designer membership.